We've heard the new Ferrari Enzo replacement, which we've been calling the Ferrari F150, may be called the LaFerrari. That's not a joke. This image above cropped up and, while it may be a render, people are calling it a very accurate image of the car. Oh, and we've got real stats (we think). Power. Speed. The whole LaEnchilada. Let's start with the image, which looks good, even if it isn't real. If you take FerrariChat's word, then the people who claim to have seen it seem to think it's accurate. So, alas, with just a few hours to go here's an image of something that seems to match what's under the sheet. And then there's a spec board next to the car from Harry Metcalfe of EVO, which shows all sorts of interesting things. There's a 6.3-liter V12 mated to an electric motor producing what looks like 789 horsepower (800 CV) @9000 RPM and 516 lb-ft of torque at 6,750 RPM. The HY-KERS system provides an additional 160 horsepower and 200 lb-ft of torque. In total that's around 950 horsepower and 716 lb-ft of torque. All that equals a 0-62 mph time of less than three seconds with a top speed of 217 mph if real. 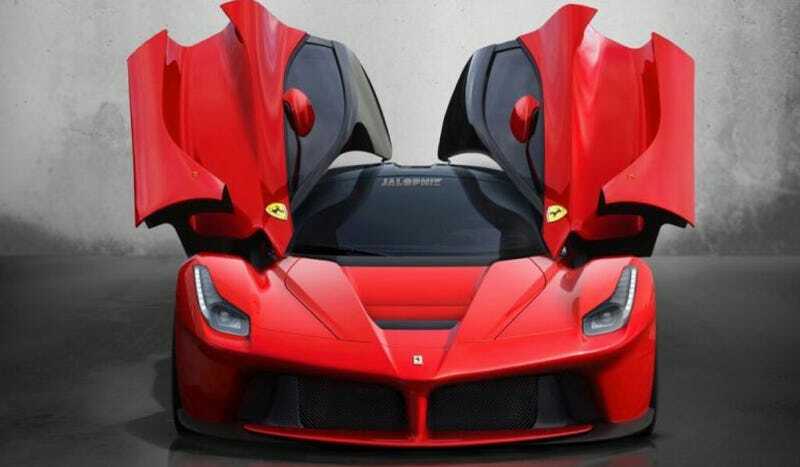 There's much up in the air, but if this is the LaFerrari its specs are significantly more impressive than its name.